This year we’ve begun sponsoring an athlete’s journey to successfully completing the Iron Man 70.3 African Championship on the 15th of April 2018. 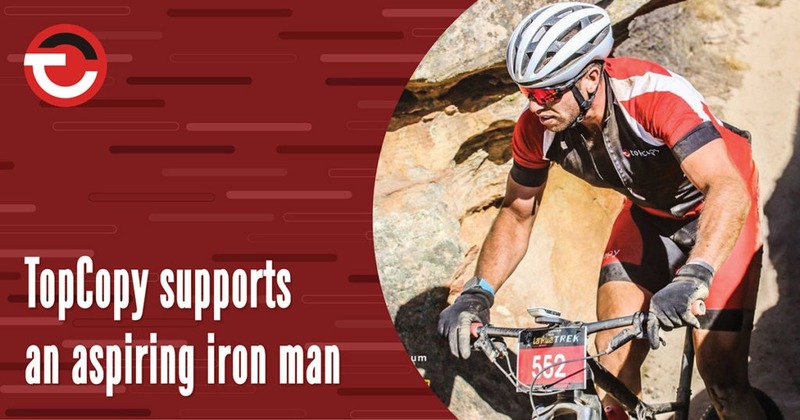 To date we’ve supported Tony’s participation in the highly competitive Iron Man 70.3 South Africa 2018 triathlon event in January, as well as the gruelling ± 260 km Tankwa Trek cycle race in February. The annual Tankwa Trek cycle race based in the Koue Bokkeveld of the Western Province, which Tony claimed to be the hardest race of his life, consists of three stages spanning a distance of over 80kms each. Though normally a team participation event, Tony cycled each stage of the event alone over the 9th, 10th and 11th of February, picking up a few tyre punctures and mechanical issues along the way, yet still proudly representing TopCopy. The three-day race event was both a demanding test of endurance and motivation, as was the Absa Cape Epic earlier this month. Tony regards these races as intense training preparation for the main Iron Man event taking place in April this year. Stay tuned to follow his progress! This entry was posted in Iron Man and tagged Absa Cape Epic, African championship, athletic race event, cycle race, Iron Man competition, Sponsor athlete, Tankwa Trek, triathlon event.